Hero standard 3. Special growth milk for your toddler! This diet is adapted to the nutritional needs of children from 10 to 12 months. Content: 800 grams. Hero Baby Standard 3 is a follow up milk for babies of 10 months and up. The preparation of 200 ml infant formula is to solve 6 scoops of 5.5 grams of milk powder in 180ml of cold or warm water. An open package fo Hero Baby Standard 3 will last for 4 weeks. Hero Baby Standard 3 is your logic choice. It's a complete, easily digestible and contains prebiotic fiber, nucleotides, iron, vitamin D and important fatty acids DHA / AA, all the nutrients your toddler needs in the right balance. From 12 months Hero Baby Standard 3 can be replaced by Hero Baby Toddler Milk 4. 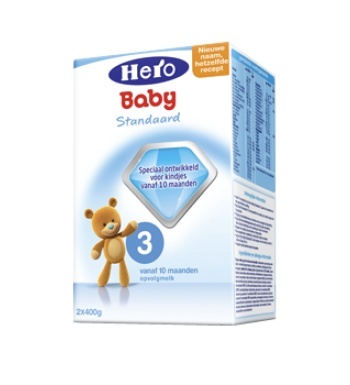 Hero Baby Standard 3 contains two foil packs of 400 grams and is enough for 26 bottles of 200 ml.